While no one likes to be discriminated against, everyone likes to feel special. 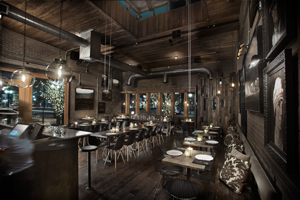 Creating different areas of your bar for different people can be a very important factor. Whether you use this with outdoor furniture or indoor settings it can be a vital part of any popular establishment and has been used many times in the past to get great results as well. Depending on your clientele you may want to use this or you may want to avoid it. We’ll tell you a bit about your options there. For those who want to use this to make money you could have the areas cut off by how much people want to spend. You could even have access to special menus or other items that you can only get in the area. However the most common method for this is to have it based on importance, so that only those who have personal fame or are close friends of the owners can get into the best areas. Whether this is right or wrong to do is up to you to decide. 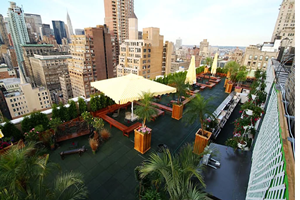 Depending on what you want to bring to your people Outdoor Furniture can also differ between the areas. For example you may want to have nice but normal pieces in one area and outlandish items in another. Weird items from unusual art to bubble pits have been popular parts of some of the more active bar scenes in the world. You can learn something from their example by adding such outlandish designs to your own setting as well. If you do not want to make anyone feel left out you may also consider splitting it into rooms but letting everyone have access to each one. This is an extremely popular idea in modern architecture and happens all the time both outside and inside. Indeed, many restaurants and garden settings use this but let everyone go where they please to simply add some additional variety to the area. So far customers have been very pleased with it in many establishments. Back to the topic at hand you can even create this with your outdoor furniture. Tents with attendants at the entrances are one great way. Other options include translucent plastic items and other enclosures that allow people to see the scenery but still feel like they are in a different setting than the other people nearby. 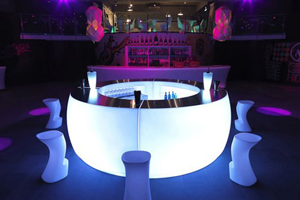 As such you can create that VIP atmosphere anywhere you want it to be without much trouble. While you do not usually want to create jealousy from one person to the next it can actually be a driving point for business. Pretty much all of the greatest businesses in the world have done this at one point or another in order to make sure they created an atmosphere which strove for the best, or wealthiest, clientele. This pushed them to success and you can create the same setting for yourself if you really work at it. Just be sure that this is the sort of clientele you want. Bars with outdoor furniture set on the sides of buildings have become much more common. Many major cities now have these on the top of buildings or at least on a high floor for a decent view. In either case you need to be safe when you are enjoying yourself on one of these. As an owner you actually have a responsibility to care for your patrons as well. This is more or less important depending on what the laws are in your area and what the atmosphere of your establishment is. Having proper flooring is the first step when creating a setting such as this. You want a level setting which does not get slick in rain or other harsh weather conditions. Slipping and sliding is not something that anyone needs to do when you are three or four stories up. In that case you could actually injure an employee who is working for you and is just trying to improve things for an upcoming event. Outdoor Furniture should be placed so that there is no chance of someone simply sliding off the side. Ideally you should have a guard rail or even an overhang that they fall onto. While this isn’t always possible early on you should do everything you can to get this fixed. Unfortunately not even those will protect everyone who hangs out at your establishment so you need to be careful in other ways as well. For those with a rowdy party atmosphere you may even want to have a bouncer on duty looking over the area. Why? Because someone can really hurt themselves if they have somehow managed to get very drunk and decide to enjoy the view. It happens all the time in bars all across the world that someone falls off an elevated area or is stopped from doing so by a vigilant caretaker. This is perhaps the best way to make sure no one really gets hurt. You do not want to deal with the alternative. When choosing outdoor furniture you should also try to secure any pieces you can if you expect some of your patrons will get rowdy. Even a small mistake with leaning back too far can lead to an embarrassing or extremely painful crash. By securing it you can make sure that no one falls over or even uses it as a weapon in some cases. We’re sure you don’t want anything like that happening but you never know what can happen when you are having a particularly raucous time. Basic rules should also be in place for when guests are out on such an area. Many people think that adults have some form of common sense but that does not always hold true. Especially when drinking is involved common sense can fly right out the window. Or in this case it can fall off the side of a building where you are hanging out. Everyone who comes in should follow these or they should leave before something bad happens. Sometimes you just want to light up the night for your people. There are many different ways to do this in the modern day so we’ll go over a few. 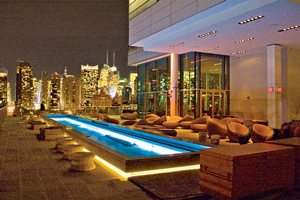 Even your outdoor furniture can become a part of the illumination and really impress your visitors. So how do you go about setting something like this up? We’ll go over a few ways and discuss the pros and cons of doing this in your own area as well. You never know when something will work for your guests. The traditional method for lighting everything up is just to have some lighting. Even in this area you have a huge number of options from weather-resistant pieces to track lighting which can illuminate a large area. Even a spotlight can be an important piece for some people so you should keep that in mind. If you have a large area to cover then you may want to go with this traditional method. Pieces of Outdoor Furniture that light up come in many varieties. One simple way to set these up is to simply get some neon paint which glows in the dark. Unfortunately this can be a bit overwhelming for some so make sure that your guests do not think it is too tacky. If you have a party atmosphere then they should not mind at all since bright colors draw the eye and fire people up. Since this is exactly what you want it should work out quite well for your bar. 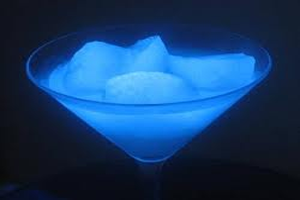 You can also serve some translucent drinks or simply have serving glasses that light up. While it may be a bit much for some it can actually create an incredible setting for your business overall if you manage to make it all work together. All of this can cost you a bit extra so make sure you have some money saved up before you decide to look into any of these options. For those who really want to think outside the box with outdoor furniture you can go with some really strange setups. For example you could go with kerosene lamps or Tiki torches. You can even go with bizarre fuel sources such as hydrogen if you have the money. Whether this is right for you is up to what your friends and family want in a setting. Depending on their taste they might dig a hi-tech or old-world approach to any setting such as this. For those who really want to impress people you can buy all electric-powered pieces. Both chairs and tables fall in this category. You can even set up an entire bar top to light up when you flip a switch and indeed some of the best bars in the world use this for an impressive effect. While you may not be trying to reach the top of the world you can still make a profit form some of their ideas so put some thought into it. As usual speak with your guests about what they want as well. Drinks are something that every wants in any outdoor bar setting. However you might also put some thought into matching them to your decorating style. While this may seem like going a bit overboard to some it is actually something that many connoisseurs expect during this day and age. Depending on your clientele this may also be something that they want from you for a few different reasons as well. We’ll go over your options and how to decide on a proper setting as well so you can easily figure out what you need. In a useful coincidence wines and beers come in a variety of golden hues, browns and whites. There are even red shades as well. Really you can get a brew of almost any color down to green so what you need to do is figure out what works for you. Our best advice would be to pick out the vintages first, or the majority of them, then go to the pieces themselves since it is easier to match everything that way and it will still give you really excellent results all around. You can also go with unusual restaurant outdoor furniture to match some strange drinks that you may have. If you have a flaming tower of drinks then you would want a hot red table to match. Perhaps you even use unusual ice so you would want a cooler table for that. All of these help each individual drink and item stick out in the minds of customers so it is good to add that little extra bit of emphasis whenever you possibly can. You may even want to theme various rooms for other drinks and styles. Beach rooms can go alongside Irish pub styles. This has become very popular with many chain owners in the modern day so it may be a good idea for your own branches as well. Everyone likes to have a little variety but you should ask each of your patrons where they prefer to be seated so they can make them happy during every single visit. Pairing harder, darker drinks with similar furniture works great. The same can be said for fruity vintages as well. 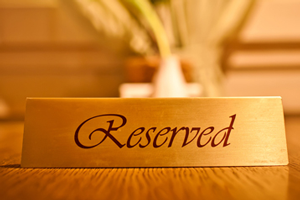 If you know your customers well enough after a certain period of time you can also seat them in the best places as well. If that sounds like too much work it might be too much for you, but at the same time you need to put in all the effort you can in order to stand out from the many other establishments around you. What is amusing about this is that even spills can lend some character to a table if they end up stuck. In that case you have to be very cable that it matches but it could actually give it an interesting stain as well. You never know when a mistake can turn into a work of art. We hope that you have the good luck to have something like that happen with your pieces. When working with any bar creating a “bistro” look with outdoor furniture can be incredibly useful. It lends an air of class and style that you do not just stumble into. Right now the look is still popular in many parts of the developed world and will likely have quite a few more years of popularity to come. Therefore you need to look into creating this in any way possible if that is the look you are going for. It can save you a lot of trouble. Those who own private homes probably don’t need to focus on this as much. Bistro style is mean for bringing in lots of business because the people there absolutely love each setup and will loyally follow you from one area to the next in order to get the feeling that the enjoy so much. As such this is an article that is geared towards business owners who need a style which will help them pay all of the many, many bills which come from such an establishment. It is not hard to find outdoor patio furniture that fits with this style either. Umbrellas, bars and metal chairs all fit in perfectly. Each of these is fairly easy to find which allows you to really work on selecting each piece individually in order to create the most amazing setup which you could possibly imagine. Just make sure you do not spend so much time that you are not getting anything else done during that day. This can be pretty easy to do with all the choices you have. Food and drinks should also match anything you set up as well. Coffee and wine are popular choices with excellent profit margins for specialized brands. As such you can expect them to gather an incredible amount of support and sheer money for you. If you can properly sell them on the theme then you could be set for life off of one establishment, or you may choose to expand into a chain setting as well. Outdoor furniture in this style should also be durable because people do not want to worry about breaking anything. As such hard woods and metals with a nice sheen are great choices which fit in perfectly with this. You may even want to get some metal lighting fixtures in order to complete the entire look and make it look really authentic, which is what you were obviously aiming for from the start and that you should be able to set up without much trouble on your own part. While the idea of a bistro does bring certain people in you should also ask your guests whether it works. Perhaps they wanted a high-brow or low-brow appeal to it. Many will be too nice to give you the honest feedback you need but there will be a few here and there who will give you what you need. Then you have to set about setting all of this up. If you need to make changes then so be it. Bar umbrellas for your outdoor furniture are pretty basic, right? Well they would be if you did not have so many choices. As far as which ones you can pick from we’ve spiraled into the hundreds of thousands between various manufacturers so it can get a little confusing when you are bombarded with so many people saying that they have the best solution out of all of them. Who has the right one? That is up to you but we will do what we can to help you decide on it. Durability is of course the first factor. You want to get a fabric that will stand up to even the harshest conditions no matter what is going on around it. Make sure that you test it before you install the umbrella fully so that you do not end up with one that stains easily and is ruined early on. Many people have unfortunately found out that the piece which they thought was going to be great is not nearly as useful as they thought. Whenever possible your outdoor dining tables should match the other pieces in a set. All the pieces, including our noteworthy topic today, should follow this as well. For many people this is quite easy to do as they just match the basic colors and are done with it. You should however also take into account your menus if you are running a business or the surrounding foliage in any case. Both of these factors can lend some additional flavor to your design decisions. Stability is another vital feature in this area as well. Users need to know that their umbrella will not fly off out of nowhere when they are eating or even collapse on top of them in some situations. Either way you need to be careful when setting it up so none of these ever become a factor either. If you can it should be tied to a heavy table so that weather would need to actually flip that same table over in order for anything really troublesome to happen with the setting. Sound strange? Not really when it’s a great test of whether you can actually have an outside setting in your area. So why would you need to focus on this with a business? Because strangely enough it is a big part of the outdoor furniture that people first see when they are making a decision on whether to come visit your place of business or to go somewhere else. Ugly or gaudy items of this sort can quickly cause people to walk on or keep driving when they are looking for a new and fresh area in which to get a meal. Another factor is how well the block the sun and rain which is sure to pound a few of your people. Larger ones are pretty handy and you may even go for one which is really large if you have the money and time to spend on it as well. While air conditioning is great having a layout which can cool everyone down naturally is very important in areas where the weather is scorching. You have dozens of different options in this area and we’ll tell you about a few which you can use on your own time in order to create a fresh look that keeps everyone feeling better over time. This often won’t cost you another extra money either as long as you plan everything early on so that it works together with each separate piece. For those who want to get a little lazy with it you can add a water feature. Even a small pool can be really useful for people at your restaurant or home. Cleaning it can be a bit of a chore so keep this in mind before you decide to go with such a setting at any point. Spills of drinks and food can be quite annoying for your staff who will soon be running around trying to keep track of all of it. Using contemporary outdoor furniture you can quickly get started on the project. Due to the huge selection of colors and shapes you can easily choose one that is in a color which does not trap light and also allow wind to pass through quickly. Simply by having seating and tables that stay cool you can really cut down on how hot all of your guests are getting as well. If you are able to combine this with other pieces of the same type you can create a look that not only cools people down but looks good too. Shade from trees and overhangs is another way in which you can keep everyone very cool no matter what is happening. Most trendy people are at least a little bit eco-conscious so this doubles as a handy way to appeal to them as well. Also what is more refreshing for eating outside than something that literally provides fresh air for us? Not much, as far as some people see it. The placement of each piece is important as well. 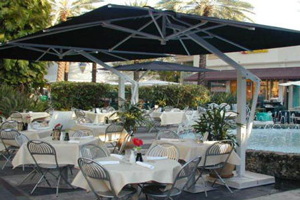 You not only want to put it into shade but in protective walkways and other areas where the architecture of your home or business protects the outdoor furniture naturally. It costs you little to do this and you can often simply move everything around yourself in order to quickly improve the whole setting without having to spend additional money. One strange thing you can do is test the direction of the wind and the strength. It may sound odd but it will give you an idea of how the weather normally is in your area and how to change everything to match it in the long run. You may find that you have been setting everything up wrong for some time and there is a better way to do it which you can easily use to really improve the entire setting. Sometimes it is best to go with your gut with these things. Thatched roofs are something that we have had since ancient times. While you do not see them paired up with every bit of furniture outside they are still a very popular accent to many settings where people are going for an organic look. Out of all the various ways in which you could achieve this the thatched style is probably the easiest way for you to handle all of this. Whether it works for you or not is something you will have to decide for yourself as well. By far the Hawaiian style is the most popular one for this sort of setting. However a cabin look using thatched wood is gaining popularity in some circles. You never see metal designs with this not because we cannot shape it in this way, but because pretty much no one ever goes for a thatched style for a modern look. It is very unusual for a design such as this to work for anyone unless you are going for a themed resort. However it can be useful if you want to stand out. 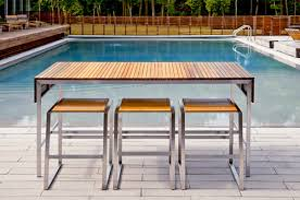 Outdoor Bar Stools with organic looks are very important for this style, we’ve discussed this briefly before. 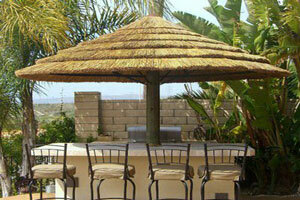 Since the natural earth tones of wood fit with any thatching quite well it’s a natural fit for both of the pieces. Other dried plant fibers are also very important for you to use in this capacity as well. Rocks and earth around the area combine with plants to compete the overall look. You may even want to import some special tropical trees as well. The only risk factor is whether it could catch fire. You should keep this in mind if you have any open flame around the area. Fortunately if you buy a pre-made model they are often treated to protect against this. If you built it yourself then you should make sure that you treat it with protective chemicals as well. Try not to use any finishes that are highly flammable. Although those are not very common in the modern day they still exist here and there. Durability is also another consideration. While this style is very useful and strong it is only as good as the design work put into it. You should see multiple thatches running throughout the entire setting and be able to pick out detailed work that someone put into making it. If not you may have been sold an item which just will not work with your other outdoor furniture and will lead to a lot of trouble for you down the road. Animals and bugs can sometimes nest in the upper area and this is only a problem if you do not want them there. You will have to handle driving them off with either some violent waving of a broom or perhaps even some chemical sprays. Be sure you have a way to keep everything clean when you are doing this or you could have a nasty surprise in the future for you down the road. Fridges are an essential part of any outdoor bar. In most cases they can even act as an additional piece of furniture in the form of table or accent. You have to be very careful in order to make sure that it does not stand out or look tacky but it can actually be a really impressive and useful item for any setting depending on how you have set everything up. It works especially well if you are going for a modern theme and want lots of hi-tech gadgets to complete the look all around. For many people fridges have become so common that we do not even bat an eye around them. However they would have been amazing for our ancestors and are still extremely useful for us today so we should take the time to appreciate them. Usually they have a strong and sturdy construction which even allows them to support serving dishes or even other furniture. This is one reason that so many of them are built into outdoor bars as well since they work perfectly with everything else. 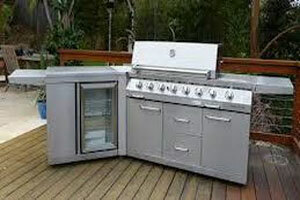 With Patio Furniture most people just try to hide the fridge away. It goes in a nook or cranny where no one can see it. This is fine if you do not have a nice one or are not planning to make it a part of the design. You should not ignore the possibilities with it if you run a business though. Having a small bar where people can grab their own beers can be quite fun. You could even have it locked normally with a manual release for when you can trust the customers there. Remote locks complete the style. Vending machines can also serve this same purpose if they are properly chilled. While not something everyone can afford these are made in many parts of the world and can be a useful revenue source for you as well. There are even designer forms of these that you can use to create a different look than the normal mall-style they have grown to expect. That style can actually cause problems with your overall setting and you want to avoid that whenever possible. As far as outdoor furniture this can take even more maintenance than many of your other vulnerable pieces. You will need electricity and some chemicals, depending on the design, in order to keep everything running well. You may even need a technician to come out at some point in order to make sure that everything is in good shape so keep that in mind as well. Every dollar you spend on it is one that goes towards maintaining an incredible setting outdoors. Fitting this into a modern, technological setting is find but it can be harder to set this up in an organic, rustic one. You may need to disguise it with a texture that looks like it could fit in with nature and also make sure that your guests understand it is worth it for the convenience.